From the day she was born she demanded our attention. As first time parents we didn’t just ease into parenthood, we were rocketed. She was impatient to feed, and content with short bursts of nutrition rather than the regular 3 or 4 hour feed rotation. She would not sleep for long, day or night. I remember when I was younger I used to set my alarm to watch the sunrise as it was rare for me to be awake at that hour. I feel I have now seen enough sunrises to last me a life time. The nursing sister and half the village kept saying you need to get her into a routine. I tried endlessly, probably tried too hard. She obviously hadn’t read the rule book, she was on her own time zone. Words such as demanding, stubborn, tiring are all so negative to describe her. Lets just say it was an exhausting time, but we love her. As the eldest of our children she caught all the daycare, preschool and school bugs and bought them home to the family. When she fell sick she really fell sick – no half way with her! I lost count of antibiotics, ear infections, eczema, school sores even pneumonia at one stage. But a normal child really, many children are the same – its just life. As she grew the visits to the doctors decreased. By high school it was very rare to be sick, let alone a visit to the doctor or a day off school. I thought we had got through ‘unscathed’. Its every parents hope, that their children are healthy. She developed her own strong personality traits. She is still stubborn and while I wouldn’t say lazy she has always found ingenious ways to do tasks that require the least amount of energy and effort. She enjoys sleeping late and is definitely a night owl. She has never been someone to stick to routine. The house is alive when she is home and ever so quiet when she leaves. Her world changed last year. She felt weak and sleepy more than normal, she was losing weight quickly. She put that down the long hours working in the tropics. She developed skin conditions, was that just a change in washing powder? She started to lose her hair. Not just a few scattered on the shower floor, but clumps you could pull out with your hand. She was eating or sipping enormous amounts of water icy poles, going to the toilet up to 15 times a night. When she came home and I saw the amount of food she was eating (mostly mums baked goods) and the weight still dropping I detected something was wrong. I wish I wasn’t right. She knew it too. We both hoped it wasn’t anything. We knew about it but didn’t really know about it. As her mother I tried to comfort her as I had when she was a child. It didn’t work so well. She was 22 years old. An adult, responsible for her life, her own health, her own treatment. Over the last 18 months of knowing and loving a Type 1 diabetic I have learnt a few things. “At least its not cancer” was such a wrong thing to say to comfort her. It belittles the condition. There are some cures for cancer. There are none for Type 1 diabetes. Type 1 diabetes is NOT the same as Type 2 diabetes. Type 2 can be controlled with exercise and diet, the body still produces insulin the person just needs to learn how to balance that. Type 1 have no functioning pancreas, their own body eats it thinking it is a foreign body. Their insulin now has to come from a needle. They will die without it. The most annoying thing you can do is compare a Type 1 with a Type 2. Don’t ever do this. Type 1 diabetics can still eat sugar. They just need to learn how to adjust their insulin to cater for it. 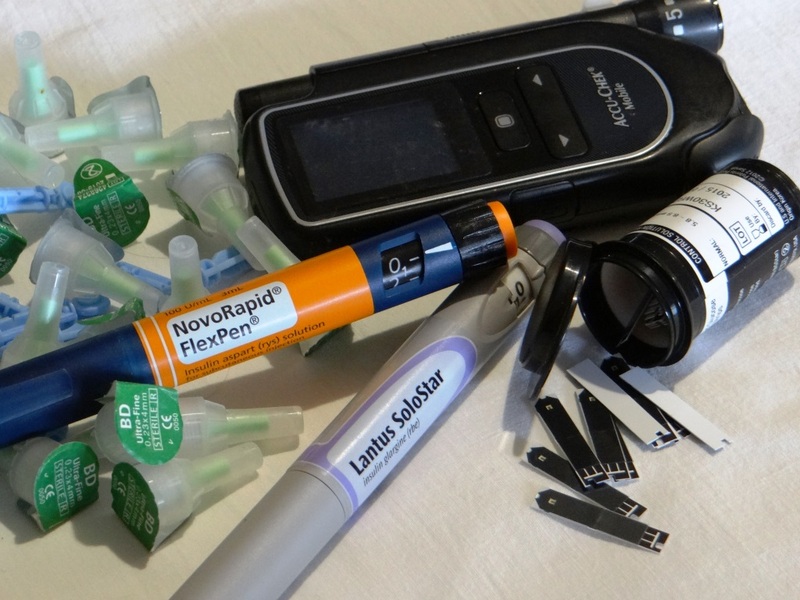 Every day for the rest their lives a Type 1 diabetic has to think about their condition. When I diet I can conveniently forget I am dieting for a day, even a world class athlete can choose not to train one day. Type 1 diabetics needs to monitor, test, count carbs, inject, test again, adjust for exercise; pack their treatment even if they are going out for a little while, EVERY DAY. A Type 1 diabetic can have a ‘low’ often, for no particular reason. They are unpredictable. This is when the blood glucose levels fall below 3 (normal is 6-8). They need to eat carbs, don’t give them insulin. This i s one thing I am still getting used. There are tell tale signs there is Type 1 diabetic in the house. Used test strips seem to be everywhere, everywhere. The vegetable crisper in the fridge becomes the insulin draw. There are mornings you come into the kitchen to find the 100 & 1000s on the chopping board – a sure sign there was low suffered overnight. The bench has needles, sharps container, testers always scattered across it. There seems to be no known cause or reason why people become Type 1 Diabetics. Was there a trigger as she was growing up, was there a sign? I went through a period of trying to work this out, could I have done something differently? This was futile. At the end of the day she now has it and most days she accepts it in a very mature, quiet manner. Most would not know she is Type 1 diabetic, she suffers in silence. She has my absolute admiration, my wholehearted support, my complete love. I pray there is a cure in her life time. Written as part of World Diabetes Awareness Day, November 14th. For people in Australia the JDRF (Juvenile Diabetes Research Foundation) is working hard to find that cure. Your donations will be appreciated.